The NRC has furloughed 3600 workers, leaving only 300 on the job - It would be absurdly dangerous to allow all 100 operating US reactors to continue operating with nearly no oversight. 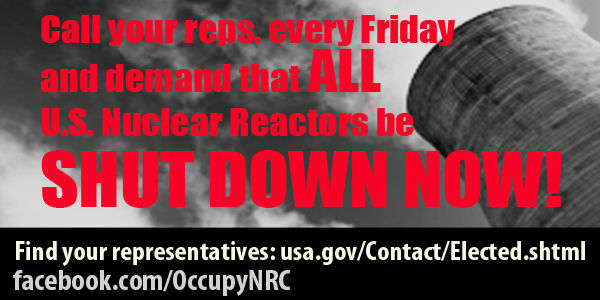 We call on President Obama and NRC Chair Macfarlane to shut down all U.S. nuclear reactors immediately. off-line because the NRC has been furloughed. Please sign the petition I created, "Shut down all U.S. Nuclear Plants Immediately due to Nuclear Regulatory Commission furlough". The NRC has furloughed 3600 workers, leaving only 300 on the job - It would be absurdly dangerous to allow all 100 operating US reactors to continue operating with nearly no oversight. It will be delivered to the President and NRC Chair Macfarlane. My first goal is 5,000 signatures.